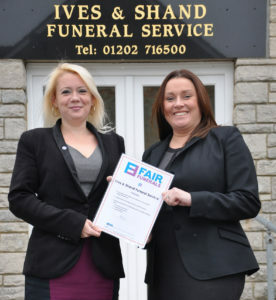 Dorset’s Douch Family Funeral Directors are the only local independent company to make the Fair Funeral pledge – and publish their funeral prices online. The scheme encourages funeral directors to be completely transparent with their pricing structure. All eight branches are signed up to the Pledge, which is run by the anti-poverty charity Quaker Social Action. The campaign is designed to highlight ‘funeral poverty’. This is defined as when the price of a funeral is beyond a person’s ability to pay. Quaker Social Action says funeral poverty has increased by 50 per cent in just three years. Many funeral directors are reluctant to talk about money with grieving relatives from a sense of traditional politeness. The Fair Funeral Pledge is part of a campaign to address this issue which managing director of Douch Family Funeral Directors, Nick Douch, is a strong supporter of. He said: “Of course, speaking with grieving relatives requires a great deal of sensitivity. “But being honest and up front with funeral prices is important for many, especially those on low or fixed incomes. “All our funeral prices are listed on our website and our funeral directors are honest about them from the start. There are never any hidden charges. “We are very happy to make the Fair Funerals Pledge as we understand the problems that funeral poverty causes. “We run the award-winning Dorset Funeral Plan allowing people to pay for their funeral in advance.